Steven (Chicagoland, United States) on 25 June 2010 in People & Portrait and Portfolio. 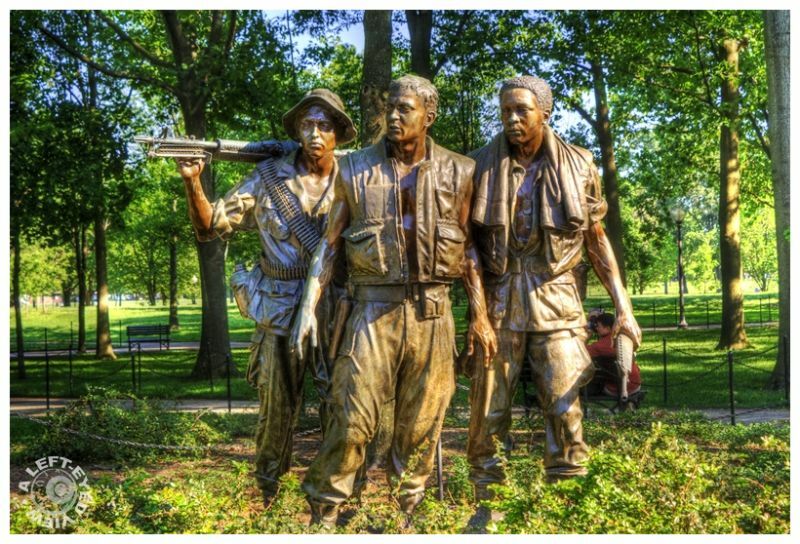 The Three Soldiers (also known as The Three Servicemen) is a bronze statue on the National Mall commemorating the Vietnam War. The group consists of three young men, completely dressed and attired in combat uniforms and fighting equipment used by U.S. ground infantrymen in the Vietnam War. While the attire is meant to be symbolic and general in nature, the personal equipment is somewhat specific in representing each man as belonging to a particular branch of military service (namely either the U.S. Army, or U.S. Marine Corps). Specifically, the lead man historically represents a U.S. Marine officer, as he wears a Type M-1955 body armor vest (worn exclusively by Marines in Vietnam), and is armed only with a Colt M-1911A1 .45 caliber pistol, secured in a holster on his right hip. On occasion, some Marine officers only carried a .45 pistol in combat, as a basic personal weapon. The black man on the right wears equipment more closely associated with a U.S. Army Soldier, such as his M69 body armor vest (which was the common type of armor vest used mainly by U.S. Army personnel in Vietnam), over which is draped a towel (which served to absorb sweat, and cushion heavy loads), which was a characteristic practice of Army Soldiers in Vietnam). He is armed with an M16A1 rifle, the main battle rifle for both Soldiers and Marines, from 1966-67 on. The man on the left is more general in his displayed gear and uniform, but he is more closely associated with an Army Soldier, than with a Marine. The uniform item that chiefly supports an Army association is his Tropical ("Boonie") Hat, which was widely worn by Army personnel in combat, and to a much lesser extent by Marines. This man wears no body armor, and as he is armed with an M60 machine gun, he thus carries two belts of ammunition on his torso. He is also wearing an M17 Protective (Gas) Mask carrier on his left hip, even though U.S. troops rarely wore or used the Gas Mask in Vietnam (namely those who used tear gas (CS) agents, such as the tunnel rats, and by troops engaged in urban/city combat (such as the Marines in Hue City, 1968). The three men are purposely identifiable as Caucasian (center), African American (right), and Hispanic (left). The Three Soldiers statue was designed to complement the Vietnam Veterans Memorial, by adding a more traditional component such as a statue that depicted warriors from that respective war. The statue, unveiled on Veterans Day, 1984, was designed by Frederick Hart, who placed third in the original Vietnam memorial design competition. I like your DC Monument series! thanks for the stories too. Great catch of those three soldiers. Great shot.. and thanks for the detailed info. Thanks for the great info which brought this photo alive. A great sculpture which brings to mind the sacrifice men made for their country. Well captured. Almost lifelike, a pretty special shot. This photo is splendid. Colours and contrasts are superb. Composition is very beautiful. Have a good afternoon Steven. Cool shot and description. In my unit, we were not allowed to wear the boonie hat but had to wear a steel "pot" helmet. Being light infantry, we didn't wear body armor, which was much too heavy, except occasionally at a fire base. Another great capture... these statues are so well made ! The clothes are looking so "real" ! Very dynamic shot! Impressive composition! Nice light and color! Superb! These monuments are so powerful in keeping memories alive . . there is a plain honesty about them that cuts right thru. Glad you got your electricity back on. The memorial photos have been stunning! Very nice . Great light and golden color on the statue . Greta looking statue ! Another symbolic sculpture and captured with your sense of camera finesse. I really like how the races are shown here.. any differences put aside as they fight together.